this is all at once not something i thought i would have to write now, not something i want to write at all and something i have not at all processed. a few weeks ago on a beautiful, sunny saturday in the midst of a “family day” outside we suddenly and dramatically lost mabel. we were spending a beautiful late september day outside with all the dogs working on some projects. mabel was doing what she seemed to love most; demanding pets whenever we bent down or were working on the ground…really leaving us no choice but to stop what we were doing and pet her or rudely push her away (we tended to do a little of each). toward the end of our ordinary, beautiful day she was gone…just inexplicably gone. we were shocked, confused and completely devastated. 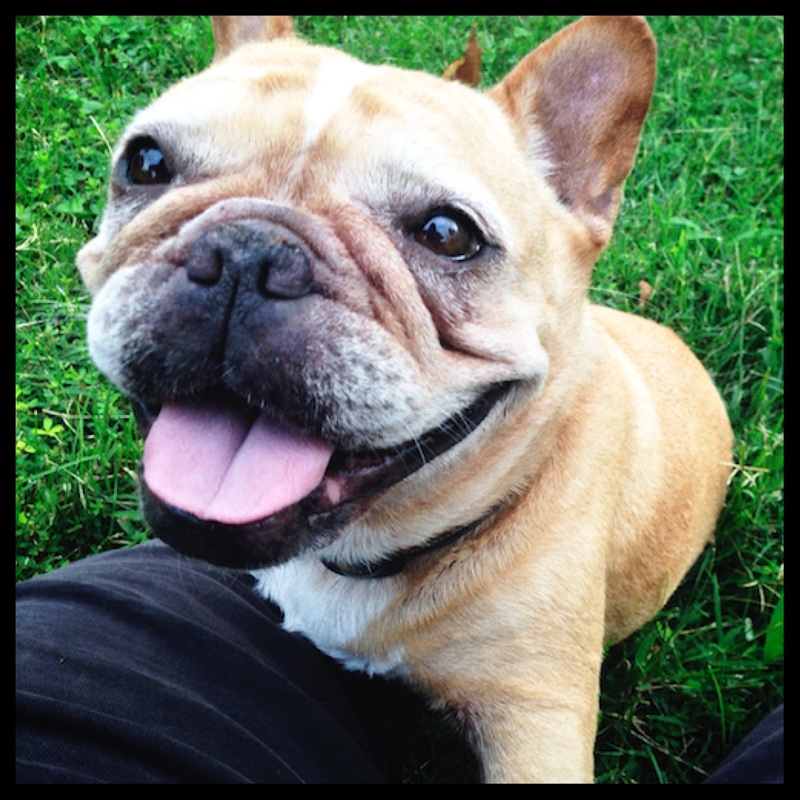 we have since found out that sudden death is common in french bulldogs…i think i’m happy i wasn’t aware of that before, although it may have saved us some personal turmoil doubting ourselves and thinking we were responsible in some way. fairly immediately after joining our family 2 years ago mabel unpredictably wormed her way into a central character of the cast that is our pack. that girl demanded constant love and attention and was a drama queen and a ball of sweetness, love, impertinence, snot, snores and smells all wrapped up in a sweet potato of a package. she made us laugh constantly, both with and at her. she was an incredible source of light with a smidge of darkness mixed in and we absolutely adored her. her loss leaves a huge hole not only because she was loved so but also because it was so unexpected, sudden and dramatic. it’s hard not to think “if only we hadn’t worked outside” blah, blah, blah but the reality is nothing would have changed the reality. however we had chosen to spend that day it still would have begun with mabel and ended without her so i’m trying to be content with the fact that from mabel’s perspective she left us in a very beautiful way, on a lovely day with no suffering, and she is now buried next to the pool that she so loved. sometimes when i can clear away the heartbreak the dramatic and sudden ending is sooooo mabel it makes me chuckle...she really mabeled it. i know this blog has become heavy on beginnings and endings and it’s my goal to begin once again to fill in the middle area and let you in more on the full life that is living with 16 dogs. if there is something you’d like to see please don’t hesitate to let me know in the comments below*. *unfortunately the recent blog move means you will need to register to leave comments but it just requires your name, email address and a password one time. i’m hopeful this can be disabled in the future to allow for more community involvement as we’ve had before. stay tuned. I am content to read whatever you write, and if posting these beautiful goodbyes helps you in any way, please continue even if the daily busy-ness prevents more everyday posts. You have such a beautiful heart and it shows every time you share with us.